Vocabulary lists are the type of thing that make students' eyes glaze over. Without context or practice related to proper usage, their effectiveness is limited. Still, I have always tried to convince my students that there can be a great deal of benefit from incorporating some memorization into the overall language learning process. This may not fit in with the most common teaching practices of the day but I have personally used some rote learning with success in my attempts to acquire other languages. I make this appeal to students as part of my overall campaign to convince them that language learning is a skill and only the most motivated will achieve the best results. I also give them a practical demonstration of the power of memorization by learning all their names in the first class of the semester. We go through the usual introductions and I write all the pupils' nick-names (I could never manage the full Thai names in one day) on the board. I then move onto other first-day administrative duties such as advising them of exam dates, drop dates etc. There is always time for an ice-breaker activity. This takes about 30 minutes. I instruct them what to do and then they mingle and ask each other questions. It's during this time that I memorize the names that I had written down earlier. After we have discussed the answers from the ice-breaker, I wipe clean the white board and ask them if they believe that I can remember all their names. I've managed to pull off this little feat without fail over the past six years with as many as 60 students in the class. It is limited in its benefit of course and can only be done with all students in the same seats. My retention for the following class isn't perfect but it is a great start and I'm certain I truly learn their names and faces much faster than other teachers who don't make the same kind of effort early on. And it usually has the desired effect of impressing them as well. Learnitlists.com has developed a clever program that combines language learning, routine and memorization. The end result is a downloadable widget that can be used on various social networking sites, google home pages and blogs. You sign-up and enter the language you wish to learn and then you are taken to a page with the day's first list of ten words. Their English equivalents are in the opposite column. 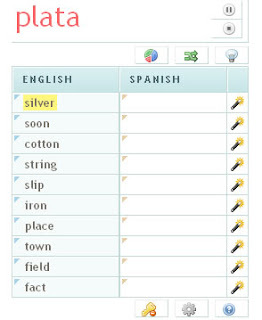 You can uncover each word as you go or see the word for the target language in the upper left corner as its English translation is highlighted in the list below. Another important feature gives you the part of speech for each word when you hover over it with your cursor. They currently have 22 options that are loaded with 1000 of the most common words for each respective language. The main benefit I see for language learners is that this could help them to build up a routine. With any task that increases a skill over time, the most important requirement is that daily practice takes place. In the first few weeks of any attempt to acquire a new ability or improve an existing one, it is incredibly easy to be knocked off stride. Establishing that pattern and seeing early results can convince a person that it really is doable. As part of a combined effort, Learnitlists has a lot of potential. However, there are a few glitches. When I registered, I was advised that a message could not be sent to my e-mail address. I don't know if this will affect my ability to access subsequent sets of words. The convenience of having the new list there every day, whether you had thought of it or not, is what will make such a program work. Another drawback is that it is somewhat limited in terms of the number of social networking sites you can download the widget to. They are apparently working on this. It would be ideal if a person could attach it to their browser's toolbar somehow. The program is currently free to download, though there are certainly more than a few requests for donations and offers to buy shares in their company. Also, I had wanted to attach the widget to the sidebar of this blog for a few weeks but I was put off by the fact that it is bundled with advertising. I would encourage the developers to forego these ads until they have some more visibility and have taken it beyond the beta stage. The success of something like this will largely depend on the distribution and marketing by the developers. I don't believe the software is especially advanced and I've no doubt that it will spark imitators (in fact, don't I know if this is the first of its kind.) The idea has many possibilities beyond language learning though that is definitely a logical starting point. I urge those interested in learning a language to take a look. I will be utilizing learnitlists in the coming weeks and will report back on any improvements to functionality and whether I have made any progress in my language of choice.